The Perioral dermatitis Photographs are © copyright protected. Unauthorized use is prohibited. Perioral dermatitis is a red bumpy condition that occurs around the mouth. Many dermatologists feel that this is a variation of acne rosacea. The difference between perioral dermatitis and acne rosacea is that acne rosacea tends to be a long-standing or chronic condition, whereas perioral dermatitis, once cleared up, tends to remain clear. A similar eruption can occur alongside the nose and around the eyes. Although this is also called perioral dermatitis, it is more appropriately termed paranasal dermatitis and periocular dermatitis. The cause for perioral dermatitis is unknown in about 50% of the cases. In the other half of the cases, the condition is actually the use of topical steroid preparations. Oftentimes the patient will have a rash around the mouth and apply an over-the-counter steroid cream or be given a prescriptionength steroid cream to use. Initially (the first seven to fourteen days), the topical steroid cream will definitely improve the condition because steroids will take away the redness and inflammation. Unfortunately, the long-term use of steroids will cause a weakening of the follicular wall in the face, leading to rupture. This actually causes the condition to worsen. This starts a vicious cycle of the application of topical steroids to calm down the inflammation, which leads to temporary improvement of the condition but long-term worsening of the condition. In the patient pictured above, she had a facial rash when she was visiting Mexico. Because many of the topical steroid preparations are unregulated outside the United States, she was able to purchase a high-potency steroid cream that initially caused her condition to improve; however, after several weeks of application, her condition worsened. When she came into our office, she described a rash around the mouth that improved greatly with the topical cream but, now, was not improving at all. We photographed her with the steroid cream she purchased in Mexico. In the half of cases where steroids are not involved in causing perioral dermatitis, it is simply treated in the same manner as acne rosacea. This can be a combination of oral and topical medications. In the case where perioral dermatitis is caused by topical steroid use, the slow and careful withdrawal of the steroid is key to the treatment of the disorder. 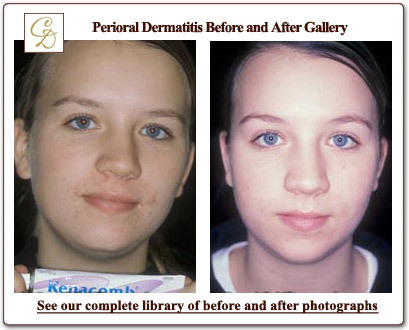 Unfortunately, there is no rapid treatment for perioral dermatitis. Essentially, a treatment plan will be devised that will take approximately six to eight weeks for significant improvement. Dr. Crutchfield will devise a plan to slowly decrease the amount of steroids and increase the use of nonsteroidal anti-inflammatory medications. Oftentimes, Dr. Crutchfield will also employ an oral medication for its anti-inflammatory properties. Once again, the nice component of perioral dermatitis is that once it is cleared, it only rarely returns. Also, patients with the knowledge to avoid the use of topical steroid creams around the mouth for more than three to five days will also prevent its return. Perioral dermatitis is a very common condition, and at Crutchfield Dermatology, we pride ourselves in our ability to treat this nuisance inflammatory skin condition.